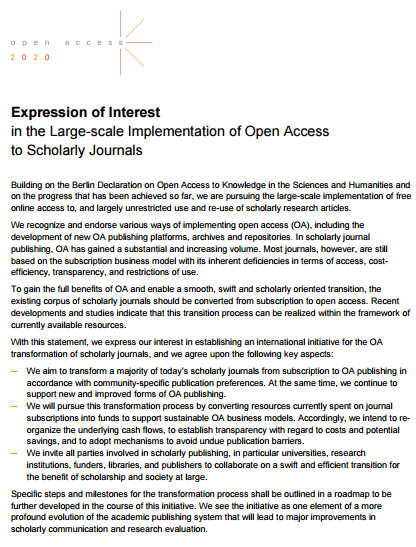 OA 2020 international initiative – launched by the Max Planck Society in March 21, 2016 - aims to induce the swift, smooth and scholarly-oriented transformation of today’s scholarly journals from subscription to open access publishing. “Open Access (OA) [Gold and Green OA] is a term used to describe a radical new dissemination model for scientific research publications. Open Access is gradually replacing the earlier method of selling journal subscriptions” (Anatomy of Green Open Access), with their inherent deficiencies in terms of access, cost-efficiency, transparency, and restrictions of use. “It is time to make Open Access the standard model of publishing”, Martin Stratmann, president of the Max Planck Society. The EoI will act as the basis for gaining consensus for an internationally coordinated effort to shift libraries’ journal budgets away from subscriptions and towards an article-processing-costs model for OA journals, thus supporting sustainable OA business models. The 51 signatories (to the present date) of the EoI have agreed to continue to support new and improved forms of OA publishing. “The list of first signatories include among others the Austrian Science Fund, the Netherlands Organisation for Scientific Research, and the Spanish National Research Council, as well as the European University Association, the representative organization of more than 800 universities and 36 national rectors’ conferences in 47 European countries” (New initiative to boost Open Access). 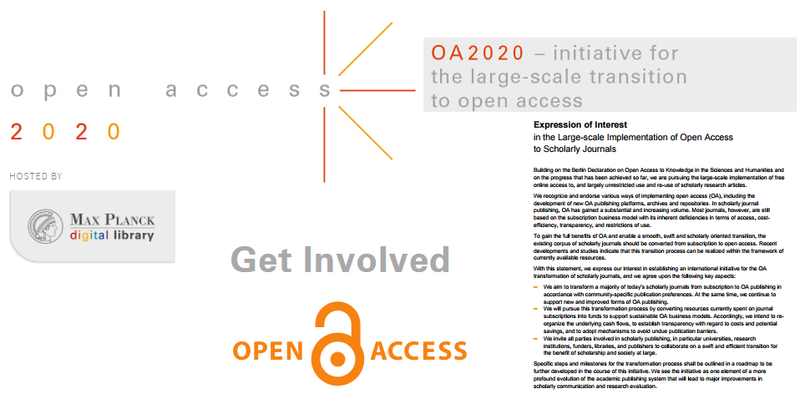 The EoI, complemented by a Roadmap (that will be further developed), is the centerpiece of the international initiative Open Access 2020, with a dedicated oa2020.org website, launched by the Max Planck Digital Library on March 21, 2016.
aims to induce the swift, smooth and scholarly-oriented transformation of today’s scholarly journals from subscription to OA publishing. The goal of the OA2020 initiative is to achieve on a larger scale what SCOAP3 has successfully done for some core journals in the field of High-Energy Physics: to convert journals from subscription to OA by re-directing the existing subscription spend into OA funds, and from these to finance the essential services that publishers provide for scholarly communication. In this way, collaboration and exchange among all parties involved in scholarly publishing - including universities, research institutions, funders, libraries and publishers - will be facilitated, for the benefit of scholarship and society at large. OA2020 builds on analysis that shows that there is already enough money within journal publishing to allow for a transition to OA that will be, at a minimum, cost-neutral. This analysis is outlined in a widely-read White Paper (the Max Planck Digital Library, April 2015). A network of “National Points of Contact” will be established across Europe as well as in the Americas, Africa and the Asia Pacific region. All parties involved in scholarly publishing, in particular universities, research institutions, funders, libraries, and publishers, are invited to collaborate through OA2020 towards a swift and efficient transition of scholarly publishing to OA. Get in contact with OA2020. Opportunities from OpenAIRE to fund your APC-free Open Access Journal!The call for proposals will remain open until the 30th of June!